In 2011, a group of wineries and growers on the far western, coastal part of the Sonoma Coast AVA joined to form the West Sonoma Coast Vintners (WSCV) association. The goals of the organization were to facilitate collaboration among members of the unique region, preserve and protect the history, landscape and culture of West Sonoma Coast, and promote the wines from the West Sonoma Coast to the media, trade and consumer. Members are advocates for wines with a clear identity evoking the complexity of the region and the authenticity of the community. The WSCV vintners and growers are located inland within a short distance of the Pacific Ocean shoreline, within a climate ideal for a special expression of Pinot Noir and Chardonnay. The growing season is cool, dry and extended so that grapes develop intense flavor and acidity without high sugar. This cool climate viticulture is literally farming on the edge, where grapes struggle to ripen resulting in a dynamic tension in the wines. larger than the size of Burgundy, including Chablis, the Côte d’Or, the Côte Chalonnaise and the Maconnais. Formed in 1987 primarily through the wishes of Sonoma-Cutrer Vineyards who wanted to include all their scattered major vineyards in one boundary so they could use the “estate bottled” designation on their labels, the vast Sonoma Coast AVA extends from the Sonoma County border with Napa in Carneros bordering on San Pablo Bay, to Marin County and the Pacific Ocean 30 miles to the West, progressing north through Sonoma County, and reaching its most northern limits at the Mendocino County border. 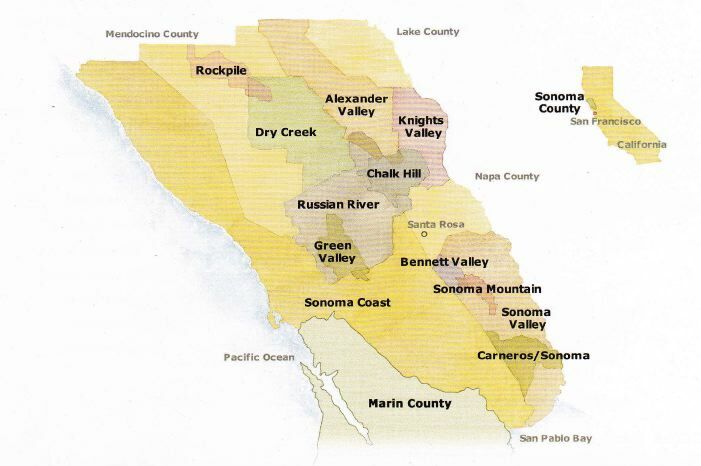 It overlaps five other Sonoma County AVAs including the Sonoma part of Carneros, a sliver of Sonoma Valley, the western part of Chalk Hill, all of Green Valley, and most of the Russian River Valley. The overlap between the Sonoma Coast AVA and Russian River Valley AVA has created some confusion in labeling as Pinot Noir grown in parts of the Russian River Valley can be designated Sonoma Coast. 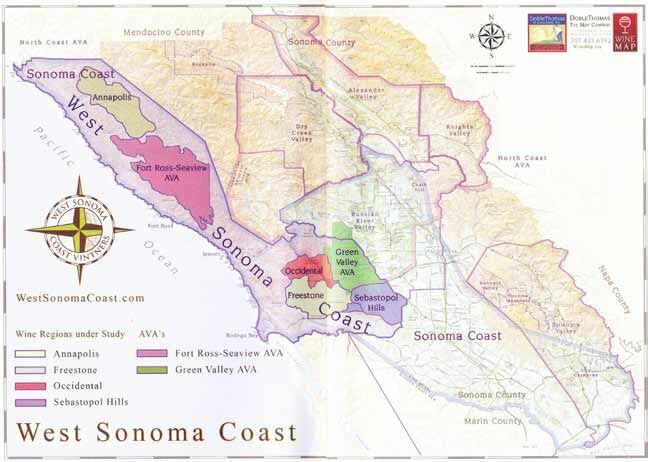 Because of the enormous size of the Sonoma Coast AVA, an unofficial subdivision has been created designated West Sonoma Coast, which makes up about 10% of the entire Sonoma Coast AVA. A number of names have been proposed in recent years for this subdivision including “far,” “true,” and “real,” but the WSCV prefer the region to be addressed as the West Sonoma Coast. The West Sonoma Coast subdivision, as shown in the map below, extends roughly from Jenner in the South where the Russian River empties into the Pacific Ocean to Annapolis in the North, and from the beaches to 5 to 12 miles inland including the first three ridges of the Coastal Range of mountains, extending more easterly in the South to include Freestone, Occidental, Green Valley and Sebastopol Hills where coastal ridges flatten out. Referring to the map above, the West Sonoma Coast has been unofficially divided into six subregions that are so dramatically different that they warrant further study. From north to south, these include Annapolis, Fort Ross-Seaview, Freestone, Occidental, Green Valley and Sebastopol Hills. The 27,500 acre Fort Ross-Seaview subregion officially became its own AVA in on January 12, 2012, (see Part II and III of this report). The entire Sonoma Coast has over 7,000 acres of vineyards, dwarfing the over 700 acres found in the West Sonoma Coast (exact figures are not available). The West Sonoma Coast has few wineries (Annapolis, Flowers, Freeman Winery & Vineyards, Joseph Phelps Freestone, Hirsch, Littorai, Marimar Estate and Peay), but over 50 growers farming mostly small vineyard plantings except the 300-acres on a 600-acre parcel near the hamlet of Annapolis owned by Kendall-Jackson. The biggest challenge facing growers in the West Sonoma Coast is unprofitably small yields making farming not for the faint of heart. Ted Lemon, who was an early proponent of the West Sonoma Coast, points out that the West Sonoma Coast is a highly diverse and complex region and there is much to be learned about the proposed subregions. There is an endless array of mesoclimates and soil types. The learning process about the region, one of the purposes of the WSCV, will take generations.